With these six easy steps, you’ll transform your leaf-covered hole in the ground into a pool fit for summer pool parties. Rainwater and melted snow can collect on the top of your pool cover and trap leaves and other debris. Use a leaf net to remove the debris, or try using a leaf blower for a time-saving pool hack. Extract the standing water with a water pump. It is important to store your pool cover properly so you can reuse it at the end of the season. Clean the cover; let it dry; and store it in a safe place. Do not skip the drying process or mold could develop; and do not leave the cover on your lawn, because it could ruin your grass. What’s a pool without water? Some pool owners choose to drain their pools at the end of the summer season. Others choose to leave the water in the pool and purchase freeze plugs to keep the water from freezing. If you drained your pool, fill it back up with water. If you chose to keep the water in the pool, remove the freeze plugs then replace any lost water by filling the pool to its normal operating level. Before your filter can work efficiently, you have to prime the pump. Start by locating the handle of the multiport valve on the side of the filter. Once you’ve found it, turn the handle to the “filter” position. Open all of the central valves (skimmer, bottom drain, returns and sidelines if equipped), then open the strainer pot. The strainer pot is located on the pump. Take the lid off and fill it with as much water as it will take. Replace the lid and turn on the pump. The pump will begin to prime anywhere between 10 seconds and 20 minutes. When you start to see air bubbles, the pump is priming. If, after 20 minutes, you don’t see bubbles, remove the lid and fill the strainer pot with water again. Once the air bubbles stop, the pump should be at full prime and the pressure gauge on the top of the filter should read between 10 to 20 p.s.i. Once your filter is cleaned and your pump is primed, it’s time to clean the water. Add a double dosage of shock treatment to a bucket of pool water (do not use tap water). Once the shock treatment has completely dissolved, add the treated water to the rest of the pool water. Wait 24 hours for the treatment to fully incorporate into the pool water. The water is treated, and now it’s time to clean. Remove any large debris with your leaf net, then use a vacuum to extract any dirt that has accumulated at the bottom of the pool. After the pool is clean, collect a sample of the water from your pool and bring it to any of our Seven Seas locations for a thorough water analysis. We’ll make sure your pool is swim-ready! Install any diving boards, ladders or handrails; dust off your pool toys; and position your patio furniture. Now, all you need is your favorite bathing suit and your friends because your pool is ready for the summer! 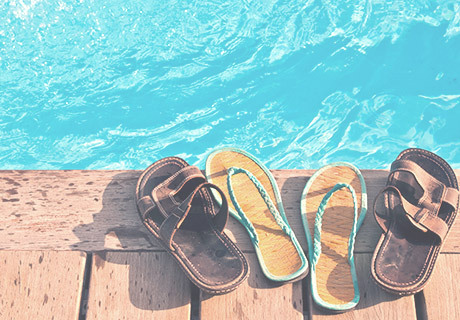 If you’re not feeling up to opening the pool but want to enjoy your backyard oasis, schedule your pool opening online and we’ll perform all of the aforementioned services for you. When do you open your pool? What’s the easiest way to clean your pool cover? Tell us about it in a comment below!